Staff at a Larchwood Care home are redecorating communal rooms in dementia friendly colours to create a relaxed environment for residents. 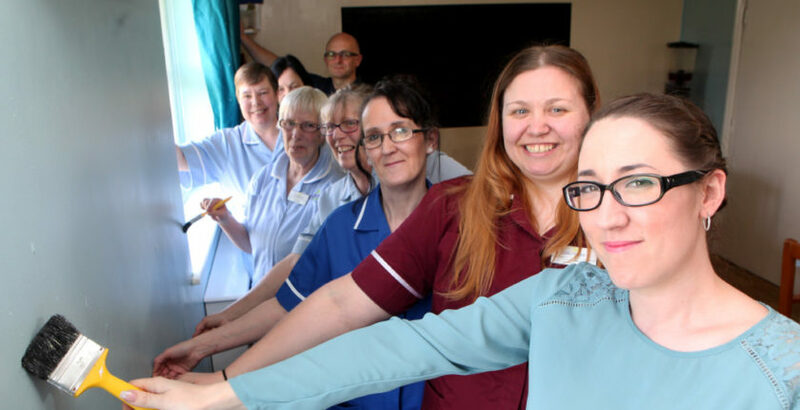 The makeover of the dementia unit at Wordsworth House in Hapton, Burnley follows staff research to identify the colours that help residents living with dementia feel at ease. Unit manager Collette Sharples said: “We chose light blue for the dining room as it is soothing and serene, and it helps the residents to feel calm while they’re eating. Handrails in the unit were painted royal blue to contrast with the yellow corridors and increase their visibility. “We chose lilac and purple for the lounge, as this colour is also soothing and calming and can make the space seem bigger,” Collette added. Home manager Aimee Green said she “was incredibly proud” of the team’s work in redecorating the unit. “It looks fantastic, the residents love it, and they’ve done a brilliant job,” Aimee said. Wordsworth House, which provides residential care for up to 40 older people, is managed on behalf of Larchwood Care by Healthcare Management Solutions.